Witamy! 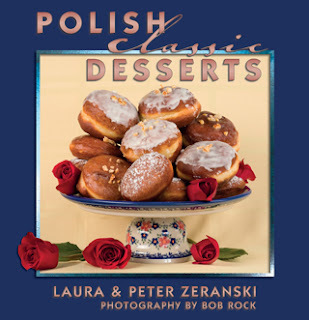 October is Polish Heritage Month, and a thoughtful way to showcase our heritage is to give the gift of authentic recipes that have been handed down from generation to generation. Christmas is coming soon and our book makes a great gift for younger generations who may not have the old recipes passed down the family tree, or who would appreciate a little guidance and pictures to show what the dish should look like. One of our friends just bought ten copies for all her friends, and we just met another gentleman during the Festival at Czestochowa who bought six copies for each of his kids, to help them preserve their heritage. Sure, this is a shameless plug, but the fact is that that everyone who has flipped through the pages, and laid eyes on Matthew’s gorgeous photography absolutely loves it. As long as I’m plugging, the young man who photographed our book is a very talented extreme sports photographer. He also has a passion for food and loved tasting every dish captured by his camera lenses. We now have a convert to beets! Check out his work: www.matthewaronroth.com. He’s based out of Long Island NY right now, but if you know anyone who needs a professional photographer, Matthew is willing and eager. Potatoes have always played a large role in shaping classic Polish cuisine – especially comfort foods that originated in the country and on farms. We recently met a lady who swears that Polish potatoes taste so much better than Baltimore potatoes - because of the dirt they were grown in. Okay, I believe her, but I haven’t found any Polish potatoes at the farmers markets we frequent, so we’ll have to go with Idaho spuds...or whatever is available. Here is a very classic, old timey recipe for a potato-based side dish that really goes well with braised meats. Drain the uncooked potatoes in a colander or strainer and press them well to extract the moisture. In a bowl combine all the potatoes, about a half teaspoon of salt, and the egg. Form into small balls, about ¾ to 1 inch across. Gently roll each in the flour. The uncooked dumplings will be quite delicate...lower them carefully into a large pot of lightly boiling salted water. Cover, bring back to a low boil. Cook uncovered on high heat until they float – about 5 minutes or so depending on their size and density. (Hint: with a spatula nudge and release any that are stuck to the bottom of the pot; 2nd hint: test one of the 1st floaters to see if they are cooked through). Drain and transfer to a warm serving platter. Sautee the bacon with the onions until the bacon is crisp and onions are golden. Pour over the dumplings. Garnish with a bit of sour cream if desired and dill sprigs for color. Serve with braised or roasted meats. Smacznego! PS: Tell us how they came out – we love your feedback. Witamy! Catherine de Medici, the Italian wife of Henry II was responsible for many famous refinements of European cookery. From Florence she popularized serving vegetables with the main meal – mostly roasted and boiled meats, some fish and a little honey for dessert. Looking back through history, there are several instances of French and Italian nobility having intermarried with Polish nobility. And that’s the overly short and simplistic version of how Italian and French influences showed up in refined Polish cuisine. I’ll be honest here – I’m not a huge cauliflower fan. Laura has a couple of recipes I like, but for me the taste of cauliflower needs to be “enhanced.” But here is a very nice cauliflower salad, adapted from the French, that works well for a buffet dinner party or just as an “un-boring” change of pace for dinner one day this week. Cauliflower is plentiful this time of year so here’s a new way to take advantage of fall harvests. By the way, this is a good dish for trying a new healthier version of mayonnaise, made with olive oil for half the fat and calories (according to the label). For my palate, the taste is quite similar to regular mayonnaise. I detected a slight lemony note which was not at all unwelcome. Place cauliflower in boiling salted water, cook until just tender - about 10 minutes. Drain and cool. At the same time, in another pot, cover the red cabbage with boiling salted water. Cook for 10 minutes; drain and cool. In a bowl, combine the cauliflower and potatoes, pour in half the vinaigrette. Taste and add more vinaigrette as desired but don't drown the vegetables. Place a few salad leaves on a serving platter. Arrange the salad on the platter and sprinkle with dill. Arrange the red cabbage on the platter around the cauliflower for color. Garnish the top with egg slices and sprigs of dill. Combine all the ingredients and whip or blend until smooth.